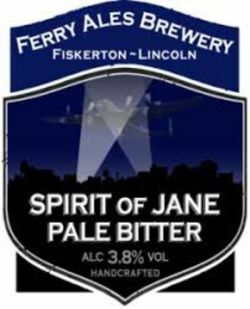 A traditional pale session Bitter, Spirit of Jane is a complex session ale with layers of malt and hops with an intense fruity finish. Ingredients: Water, Pale Malt, Chocolate Malt, Hops and Yeast. Contains: Gluten. UPDATED: JAN 12, 2019 Bottle at home. Just a bit dull. Pale amber colour with a thin white head. Malty aroma. Dry taste medium body. UPDATED: DEC 10, 2018 10/12/2018. Bottle from Message in a Bottle, Cleethorpes. Pours golden with a frothy just off-white head. Aroma of malt, hops, bread, biscuit and fruit. Medium sweetness, moderate bitterness and body. Slight oily and watery texture, average to soft carbonation. Not bad. Bottle @ Lincs tasting, Højbjerg. Nice head with good duration. Color is golden. Aroma and taste are grass, malt, bread, hops and has a nice bitter finish. Hint of butter.